Alice in Wonderland Jigsaw Book: with seven 48-piece jigsaws- by Lewis Carroll. With John Tenniel illustrations, coloured by Harry G. Theaker and Diz Wallis. This edition published by Ted Smart, 2000, but first issued by Macmillan in 1999. 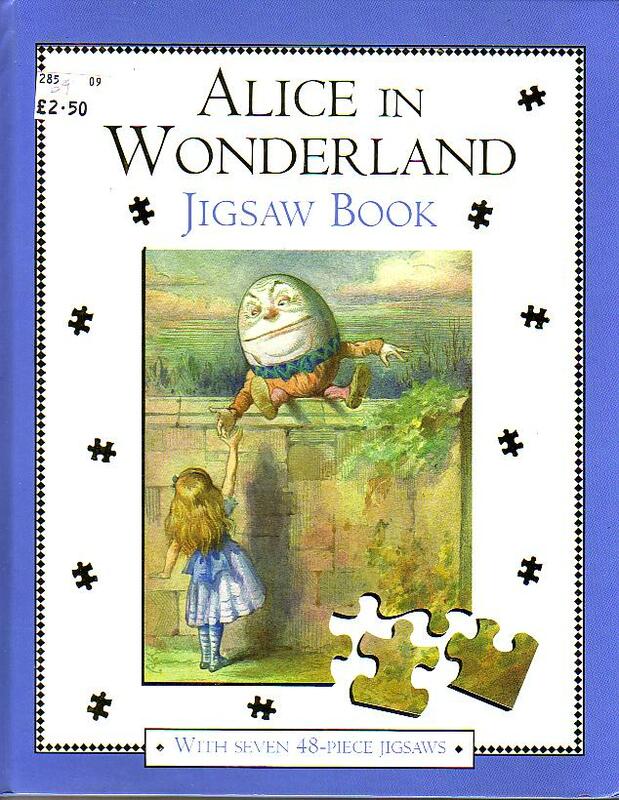 A gift book with some of the most famous illustrations in “Alice’s Adventures in Wonderland” and “Through the Looking-Glass” presented as seven 48-piece jigsaw puzzles. Each puzzle is accompanied by an extract abridged from Lewis Carroll’s books as well as some of his nonsense poems and songs. 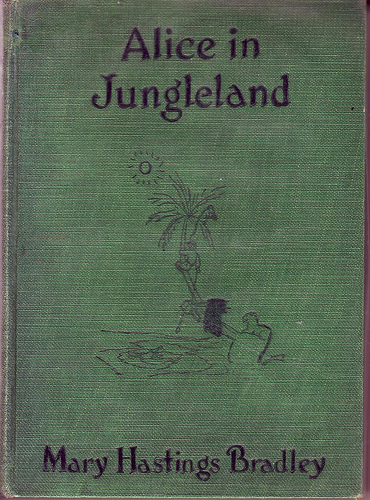 Alice in Jungleland by Mary Hastings Bradley. Illustrations by Alice Hastings Bradley. Published by D. Appleton & Company, 1928. Hardback, no dustjacket. Not strictly an Alice book: in the 1920s Mary, her husband Herbert and their daughter Alice traveled to the ‘Belgian Congo’ looking for specimens of the mountain gorilla for display in museums. These expeditions were described in three books, “On the Gorilla Trail”, “Alice in Jungleland” and “Alice in Elephantland”. Lots of shooting things. Different world: these days it’s cameras, not guns. Bought in Marchpane on Cecil Court. Well, I don’t own this, but I couldn’t resist posting it- it’s wonderful. 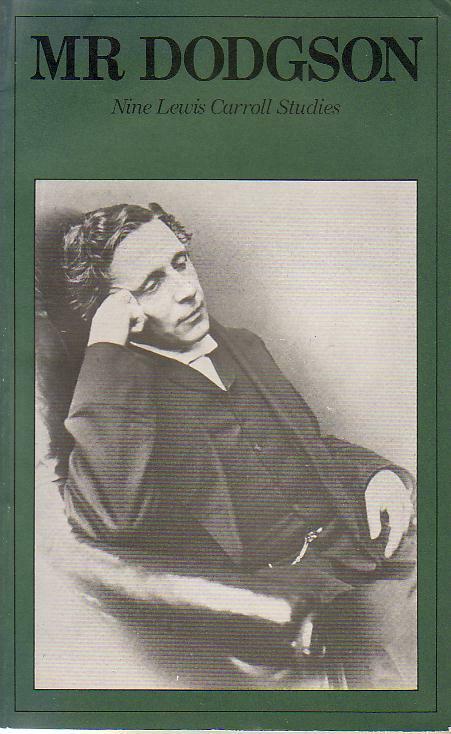 In Pursuit of Lewis Carroll by Raphael Shaberman. Published by Greenwich Exchange, 1994. Sherlock Holmes and the Author uncover new evidence in their investigations into the mysterious life and writings of Lewis Carroll. Together, they examine previous works by Carroll that have been overlooked by previous commentators. A newly-discovered poem, almost certainly by Carroll, is published here. S.D. Collingwood’s comprehensive bibliography of Carroll’s work is republished, in full, for the first time in many years. Each chapter deals with an aspect of Carroll’s highly complex personality. It will surprise readers to learn that Carroll was interested in the problems of the identity of ‘Jack the Ripper’. Carroll’s relationship with his mother and father, with numerous child friends, and with the formidable Mrs Liddell, mother of the immortal ‘Alice’ are re-examined with fascinating results. 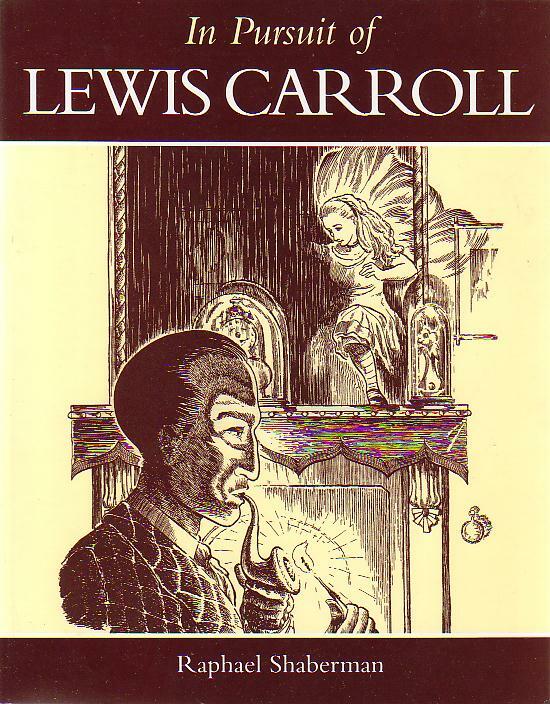 This book is essential reading for Carrollians and indeed anyone curious about the genius known by his world-famous pseudonym of ‘Lewis Carroll’. Raphael Shaberman is a life-long student of Lewis Carroll. He is a former teacher of autistic children, and has published a book on the autistic child, as well as a highly-praised bibliography of George MacDonald, the Victorian fantasy writer and author of children’s books.